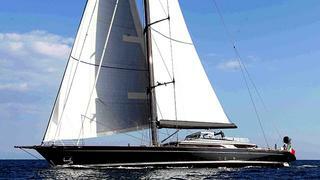 The Perini Navi Group has delivered the second of its new generation 60-metre series ­— Perseus^3. Designed by Perini Navi's in-house naval architects, in collaboration with yacht designer Ron Holland, the sloop-rigged superyacht is a technical step forward in the group’s 60m series. Perseus^3 has twin rudders, controlled by an innovative system specially designed by Perini Navi. She also features, for the first time ever on a Perini, a carbon bowsprit. This, combined with h er 75m carbon fiber mast and carbon fiber standing rigging, allows* Perseus^3* to set some of the largest downwind sails in the world. Future Fibers produced her mast and boom and the mast is one of the tallest rigs ever built in the world. She features a combined sail area of 10,000 square meters — comprising two gennakers, one code zero, one reacher, one blade, one spinnaker stay sail, one working jib and an imposing main sail. The sails are by Doyle, and company founder Robbie Doyle calls her sail wardrobe, "one of the most unique and challenging ever created". In order to handle and control the sailing system Perseus^3 features the new generation of captive reel winches and furlers. Her jib winches pull a maximum load of 30 tons and have a maximum line speed of 40 meters per minute. Perseus^3’s tacking and gybing time has been reduced by more than 75 per cent — in comparison to vessels of the previous generation — due to speed electric motors and furlers being synchronized by the Perini Navi Automated Sail Handling System. The system also dramatically improves furling and deploy speeds. Hull and superstructure were constructed out of aluminium at the Perini Navi-Yildiz shipyard in Turkey and make for a GT of less than 500 tons and an optimised displacement of circa 570 tons. Perseus^3’s interiors were designed in-house by Perini Navi and can accommodate 12 guests in five cabins, one of which has sliding beds. Her sailing prowess was demonstrated during the extensive sea trials, where she reached 16.2 knots in 21 knot winds and beat over 12 knots in similar winds at apparent wind angles in the high 30’s.